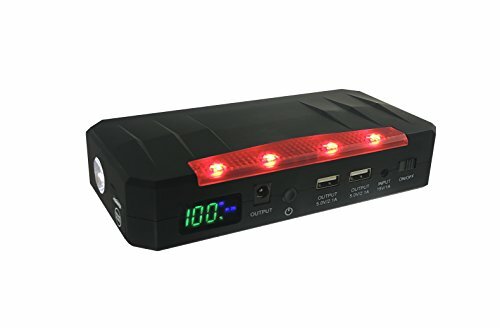 This 21,000 mAh (750A peak) capacity portable jump starter will jump start your car anytime you may be stranded without waiting for help to arrive to get you moving quickly or in situations when you don't have cell service and unable to request assistance. Exclusive 2016 technology overcomes the typical issue that most jump starters have working in cold temperature and will work in extreme cold and hot climates. We use upgraded metal alligator clamps that won't break like the typical plastic hinges that are especially brittle in cold temperatures. We use the latest Lithium Ion battery and high quality technology safety features to ensure long lasting safe life. Can charge the jump starter up to 1,000 times. Able to charge multiple USB devices at the same time. Super bright flash light with 3 modes allows you to see while you jump start your car or fix a flat. Red hazard light that can be used to warn others and keep you safe Kit includes: Portable Jump Starter and Power Bank Jumper cables with smart cable technology and metal alligator clamp sac charger Car charger USB cable to charge most phone and tablets Cable to charge most laptop Carrying case We back our products with a lifetime warranty, see website for details. If you have any questions about this product by BFXenon, contact us by completing and submitting the form below. If you are looking for a specif part number, please include it with your message.